After books, my second favourite form of escapism is DVD box sets, or more recently, Netflix. Today I thought I'd round-up five of my favourite shows for you. If you haven't seen any of them, do yourself a favour and watch them. They all offer something a bit different, I'll try to touch on that below and are all pretty darn fantastic. Of course I am biased here but seriously, they are worth watching and re-watching. Parks and Recreation: Or Parks and Sparks, as it is known among some of my family. Don't ask. This show is described as The West Wing meets The Office (the US version) and I believe it is created by some of the people responsible for the latter. Leslie Knope works in the local government's Parks and Recreation department along with a cast of less than motivated, somewhat disinterested employees. They don't quite share her enthusiasm and aspirations to be the next Hillary Clinton but they sure bring the humour. This show is hilarious and it is so well-written. There's also fantastic improv too which is to be expected when you have the likes of Amy Poehler, Nick Offerman, Chris Pratt and Aubrey Plaza among others in the cast. I'm re-watching this at the moment and am thoroughly enjoying it all over again. 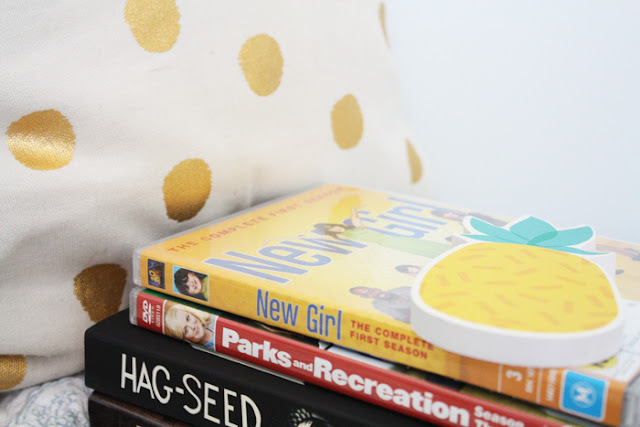 New Girl: One quirky twenty-something shares a loft apartment in LA with three other guys. Of course hilarious chaos and moments occur. I know some people think New Girl has lost its luster and I've only just started S5 so I can't really comment but I'm still liking it so far. Zooey Deschanel as Jess is just so loveable and relatable. Actually she's scarily relatable at times. I also love Max Greenfield as Schmidt. He's amazing. The Crown: Yes I am mentioning this Netflix gem again. I finished watching this a second time recently and loved it just as much another time around. I can't wait for Season Two which will be partially, if not totally set in the sixties. My favourite decade, particularly fashion-wise. There's more to this show than fashion of course. It's a thoroughly interesting look at the Royal Family and an insight into the sides of them we don't really see. Gilmore Girls: Who would have really expected this show to be here? Ahem. There's something so comforting and likeable about this show. I cannot quite ever put my finger on it but I think a lot of it comes down to the relationship between Lorelai and Rory at its simplest. That and the plethora of references plus it's just really fun to watch. I love it a lot and will always have a special place in my heart for Gilmore Girls. A Series of Unfortunate Events: Netflix is blessing us in the original series department at the moment. I've been a Lemony Snicket fan for as long as I can remember so I was really looking forward to this series. It really delivered and was extremely faithful to the books. At times there are even subtle references to later books and little nuances from the series as a whole. You don't necessarily need to have read the books first to follow this one though. If you like dark humour and less than happy tales, this is for you. Shout-out to Neil Patrick Harris for his amazing performance as Count Olaf and his many different characters. -What shows do you love?